Since the PlayStation 4 is region-free, it gives players the freedom to buy and play games from any country. Why would someone want to buy a game from a different country though? Well, there are a few scenarios where you may want this. The upcoming title Dead or Alive Xtreme 3 was recently announced to not have a worldwide release, due to concerns that the game might be “offensive” to audiences outside of Japan. If you want to play volleyball with your favorite Dead or Alive girls and watch them pole dance, your only option is to import a copy of the game. Other reasons you may want to import a game is because of censorship reasons. Sometimes a game might have content removed, depending on where you buy it. This usually happens because of censorship concerns to maintain a specific game rating for its region. Other reasons someone might want to import a game is because of the primary language that it is in. If you primarily speak a language other than English, it only makes sense to buy a game that is in a language you are most familiar with. 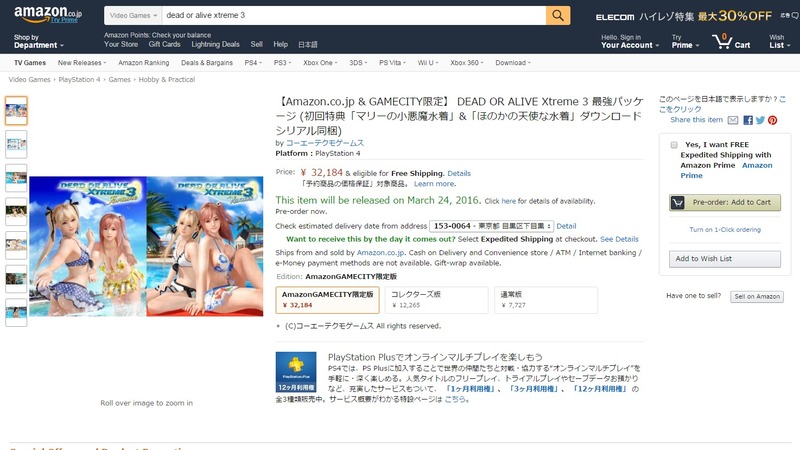 Dead or Alive Xtreme 3 is going to be a Japanese exclusive. The only way to play it is to import it. So where do you go to buy and import Japanese games? That can sometimes be an unclear question for some. Sure, you can just do an online search for “Japanese game imports” and you might find many stores, but chances are you won’t be sure who to trust. Luckily enough though, some users on the forum NeoGaf have discovered that Amazon.co.jp is now selling and shipping games to any region. This gives everyone an option to buy their favorite games from a familiar and trustworthy source. I am not trying to suggest that other shops aren’t trustworthy, but if you have never ordered from them before, you may have security concerns about how they store and protect your information. The trick to importing your favorite game is pretty simple. Just go to Amazon.co.jp and search for whatever game you are looking for. You should then see an option that says “In English”. Once you click on that option, you should then be able to more easily navigate the site. Keep in mind that it still won’t translate 100% of the site. Product descriptions and other detailed information will still appear in Japanese. Overall though, you should be able to figure out how to navigate and import anything you want. Selecting the option “In English” will translate the site, making it easier to complete your purchase. The translation isn’t perfect, but it allows you to navigate more easily. Is there a favorite site that you like to buy imported games from or have you tried ordering from Amazon.co.jp? Please share your experience and leave a comment!